Kali Katerberg/Daily Mining Gazette A poster created by South Range students as part of the Take the Challenge program. SOUTH RANGE — In the scope of human history, social media, internet and video games are just a blip on the radar. For young people, it’s always been part of life. On the upside, information, friends and entertainment are easily accessible. Research, however, has shown this ability brings a new set of challenges for families to navigate. Kristine Paulsen has dedicated herself to educating kids, teachers and families as director of Take the Challenge, a media awareness curriculum. “The idea is not to get rid of TV or video games or social media but have children and families develop healthy media habits,” Paulsen said. The retired Delta-Schoolcraft Intermediate School general education director helped develop the program with other educators within the district. The process took ten years and is still being added to and adjusted as technology changes. Paulsen is currently working on adding more social media elements to the curriculum. The program is flexible and can be implemented for students from preschool through high school age using a chosen number of lessons. “There’s not as many programs out there as there should be,” she said. Among those programs, she thinks Take the Challenge’s student education and social media reduction elements make it stand out. With six sections, students start in the program by setting goals and looking at screen habits. With that information, the students then work with families to identify how much time they are spending and begin researching entertainment media’s impact on health. Paulsen cited studies indicating a link with obesity, lack of sleep and social and emotional issues as among those students might encounter. “We have the kids actually read some of that research and the kids actually conduct their own research, one is they look at cartoons meant for young children and how many times they see the characters hit, push, punch and they’re all of a sudden shocked by how much violence there is even in cartoons for very young children,” Paulsen said. Armed with the research, students and parents work to develop new habits. These include spending a week trying to decrease entertainment media usage and replacing it with family activities. Some will choose to go screen free for a week. After the media blackout, students and parents begin to re-implement it with budgeted time for entertainment media. Finally, students create educational materials of their own, like posters, videos and PowerPoints. The feedback has been positive, Paulsen said with parents, teachers and students commenting on changes in lifestyle and behavior. Some research has gone into the effectiveness of these measures with teachers at eight schools reporting lower levels of playground aggression after the curriculum, a 55 percent decrease. In the classroom, a 48 percent decrease was reported in negative behavior. One teacher reported back thrilled with the change in student behavior. “It wasn’t until the end of the screen-free week that he realized it was the best week he had had, the kids were attentive, they were awake, they were participating,” Paulsen said. 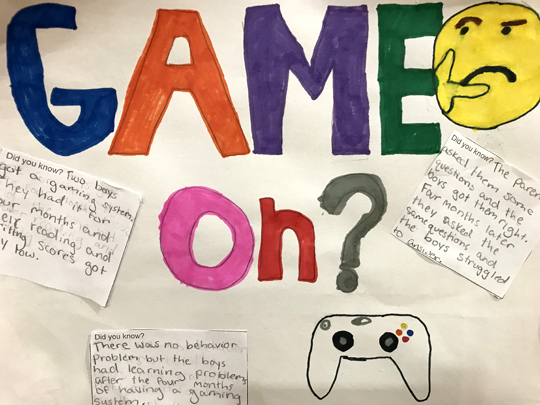 A recent evaluation was published in May in The Journal of Primary Prevention where a preliminary evaluation found students implementing the program and the media use reductions saw a reduction in TV, video gaming and internet use. Teachers reported increased focus and homework completion. Adams Township School District recently has started participating in the program with a special presentation for parents. Paulsen will be meeting with teachers and administrators in the coming weeks and was impressed with the initial level of screen use among the students.